Free in a very limited time! Merry Christmas! Hammer Nail is the app to simulate the usual action when building something. "Hammer Nail" is built as one app, lively and interesting experience, beautiful background, you could not help indulging to play, wonderful not to be missed, to download! We’d like to take this opportunity to extend our infinite gratitude to friends of our "Hammer Nail" everywhere. We thank you sincerely from the bottoms of our fluffy hearts for making "Hammer Nail" the highest rated and best selling app ever on iTunes! 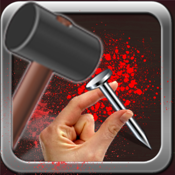 With loads of exciting and devilishly tricky gameplay, "Hammer Nail" guarantees you many hours of fun.